Though the pairing of Chicago Cubs baseball history (including the team’s historic championship season in 2016) and a pair of Pearl Jam concerts at Wrigley Field proves a clumsy pairing, this documentary is full of unique moments that delight and move. Rating: 3 stars out of 4. We hear the sound of an off-camera baseball bat whacking a ball, hard, and see a shot of Chicago Cubs fans at Wrigley Field lifting their heads up and up, as if following the ball’s home-run trajectory out of the stadium. 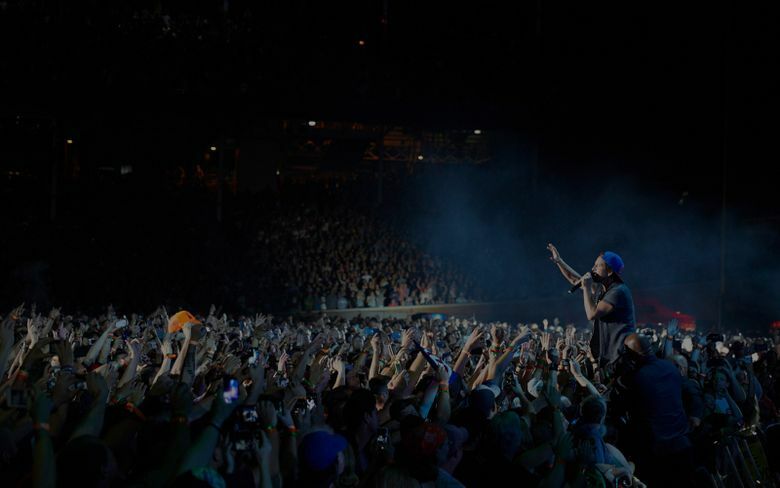 Then the film cuts to what those fans are actually looking at: Eddie Vedder, remarkably charismatic lead singer of Pearl Jam, approaching a microphone as seen from the foot of a massive stage at Wrigley. That brief, mischievous fusion of baseball and rock music stands out from an otherwise awkward juxtaposition in “Let’s Play Two” of America’s national pastime with one of America’s favorite stadium bands. There’s a good rationale for attempting to bring the two together: While Pearl Jam has long been regarded as a Seattle institution, Vedder is a native of Evanston, Illinois, and a huge devotee of the Cubs. Pearl Jam played two triumphant concerts at Wrigley as the team made its way through a historic championship season last year. ‘Pearl Jam: Let’s Play Two,’ a concert film directed by Danny Clinch. 121 minutes. Not rated; for general audiences. Opens Friday, Sept. 29, at SIFF Cinema Egyptian. “Let’s Play Two,” ultimately, is about Vedder as a champion in his own right. Whether bucking up the crowd during a seventh-inning stretch at a Cubs game, or stirring many thousands with that commanding baritone, he seems to offer himself to every moment — part oracle, part Common Man, all artist.